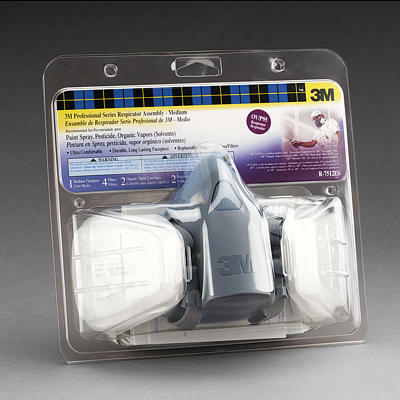 PRODUCT: 3M MODEL R-7513ES, PROFESSIONAL DUAL CARTRIDGE RESPIRATOR. SIZE LARGE. DESCRIPTION: 3M recommended for exposures to organic vapors and mists commonly associated with spray painting, lawn and garden pesticides, staining or refinishing decks and hardwood floors, and many other applications. Updated valve design for easier breathing, and heat & moisture reduction. Helps reduce exposure to organic vapors and mists associated with spray painting, pesticides or staining applications.